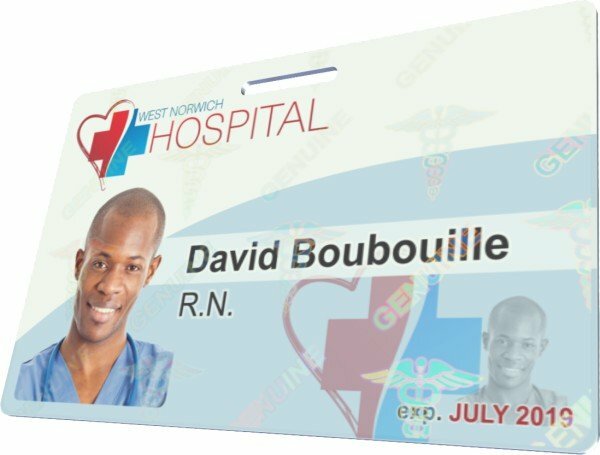 InstantCard is pleased to announce the availability of a holographic overlay specially designed for the health care industry. Previously, our medical clients who needed a higher degree of security only had the option of our standard, globe hologram. But now, working with our technology partners, we are able to offer a secure overlay only available to health care clients. This hologram integrates the Caduceus, a universally recognized symbol for medical personnel. It may be added to any card used by hospitals, clinics, medical practices, home health care agencies, and other similar companies. We will of course continue to offer generic holograms to other customers who require them. But if your organization is in the health care field, and wishes to switch to this new holographic overlay format, we will do so at no charge. If you are considering a template update, please review these guidelines for card options. The cost of the hologram will be the same as our other designs, $1.10 per card. A holographic overlay adds an extra layer of protection and security to your ID card program. The hologram makes these cards nearly impossible to falsify or copy. And it increases the durability and the longevity of the badge considerably. Don’t hesitate to ask your account rep for more information, or a sample, if this may be of interest to your company.